Ceoltóir agus cumadóir Sasanach ab ea Ian Kevin Curtis (15 Iúil, 1956 – 18 Bealtaine, 1980). Bhí Curtis ina amhránaí agus ina liriceoir leis an mbanna rac-cheoil Joy Division, as Manchain. Bhí roinnt cáil ag an mbanna, ach chuir Curtis lámh ina bhás féin nuair a bhí an banna ag éirí níos coitianta. Tá na baill eile ag seinm le chéile fós, sa bhanna Sasanach New Order. 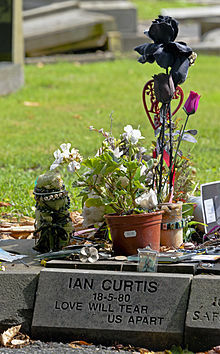 Leac uaigh Ian Curtis i Macclesfield. Tugadh an leathanach seo cothrom le dáta an 16 Meitheamh 2017 ag 20:40.